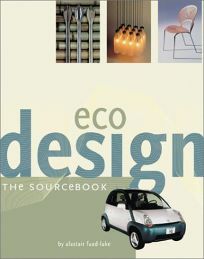 From a solar electric bus to fashions made from recycled inner tubes, EcoDesign: The Sourcebook showcases some of the most innovative, environmentally friendly products and prototypes from around the world. The 700-some designs include furniture, appliances, vehicles and electronics. Each entry in this encyclopedic reference features a photograph and brief description, as well as information about the various components of the product. The book is edited by Alastair Fuad-Luke, who teaches green design at Falmouth College of Arts in England, and includes a resource guide that lists designers, manufacturers, green organizations and ""eco strategies.""